In 1841, one year before the opening of the Mozart Memorial, members of the Mozart family and private donors founded the "Dom-Musik-Verein und Mozarteum" ("Dom-cathedral-music-society and Mozarteum"). The idea was to create a platform to maintain the tradition of music, Mozart and culture in Salzburg. 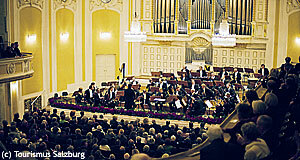 From this society the Internationale Stiftung Mozarteum developed, which today aims to propagate the music and memorial of Wolfgang Amadeus Mozart. It is an important cultural platform in Salzburg and internationally relevant for Mozart aficionados. It is this foundation that maintains and runs the two museums in the Mozart birthplace and in his living place in the Tanzmeisterhaus, as well as a smaller third one in St. Gilgen am Wolfgangsee that is dedicated to Mozart′s mother and his sister Nannerl. The foundation owns and develops the largest archive and library on Mozart, the "Bibliotheca Mozartiana". It is based on the gift of Mozart′s two sons Franz Xaver and Carl Thomas and includes 18.000 volumes of letters, books, notations, manuscripts and other forms of written record dealing with Mozart. Many of them were written by the genius himself. Since 1991, the foundation also collects sound and film documents of interpretations. The collection of the Internationale Stiftung Mozarteum is the centre of international Mozart research. In collaboration with the cities of Salzburg, Augsburg and Vienna, the foundation publishes a compendium on Mozart knowledge in 130 volumes since 1956. In addition to that, the Foundation organises Mozart concerts and festivals, co-ordinates Mozart societies around the world and does a lot of work in education. If you are very interested in Mozart and his music, you should ask for a guided tour through the headquarter in Schwarzstraße. This will also include a brief visit to the "Zauberflötenhäuschen", in which - at least according to the legend - Mozart wrote a fair portion of the "Magic Flute".